A man has been stabbed to death in the centre of London during the busiest shopping day of the year, reportedly over a pair of trainers. Amidst crowds of Boxing Day bargain hunters the young victim was chased by his attackers and stabbed in broad daylight [Sky / BBC]. According to The Sun the 18-year-old was reportedly killed after a fight erupted between rival gangs over which trainers to steal from a sportswear shop in Oxford Street. One witness told the paper how a feral gang shoved parents and children aside as they chased the terrified victim before murdering him in broad daylight. "I hope that one day I will forget his eyes and the monsters who were chasing him," the female witness, who had been with her husband and young child told The Sun. 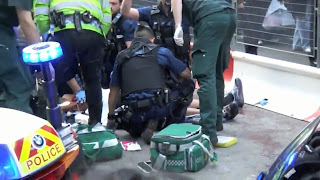 Armed police were the first on the scene and tried to resuscitate the man, while their colleagues struggled to keep back the crowds and bystanders filmed the spectacle on mobile phones [YouTube]. Police battled with youths determined to break through the cordon and one officer unholstered his taser, though the Metropolitan Police say he did not deploy the weapon, contrary to earlier reports [Daily Mail]. Efforts to save the man's life failed and he was pronounced dead at around 14:30 in the afternoon [Telegraph / Daily Mail]. In what appeared to be another incident connected to an argument over trainers, a 21 year old man was stabbed in the thigh by three attackers nearly five hours after the Foot Locker murder outside the nearby Nike Town store. Battle's have erupted at stores in the US over Nike's new Air Jordan basketball-style trainers. though many of the limited edition style have yet to become available in the UK. There have been virtual riots as teenagers battle to obtain the prized footwear [YouTube]. In Seattle, police used pepper spray on about 20 customers who started fighting at one store. A man was stabbed when a fight broke out between several people waiting in line at a New Jersey store to buy the new shoes, though the 20-year-old man was expected to recover from his injuries. Meanwhile there was panic in Richmond, California, when a gunshot rang out as crowds waited to buy the Air Jordan 11 Retro Concords at the Hilltop Mall. No injuries were reported after the firearm was discharged, apparently by accident, and a 24-year-old suspect was taken into custody. The Air Jordan has since been a consistent hit with fans of training shoes, spawning a subculture of collectors willing to wait hours to buy the latest pair. Some collectors save the shoes for special occasions, while others never even remove them from the box [WSJ]. The death on Monday in London's Oxford Street adds to a grim set of statistics. It was the 15th young person to be killed on London's streets this year. Twitter has been awash with comments concerning the stabbing. The victim was named as a Muslim youth from Somalia called Seydou Diarrassouba, from Mitcham in south London, who had the nickname "Nutz". One friend wrote on Twitter, "Naaa man! I cant believe Seydou got stabbed down Oxford st! Only this mornin he was sayin how everythin happens by the will of Allah." A special Facebook page has already been set up with a picture of the young murder victim and countless messages of condolence. One of the pictures circulating shows the man making an apparent gun symbol with his hand, which will undoubtedly raise debate as to whether he was involved in a gang. One report in the Daily Mail claimed he was a member of a gang called ABM [All 'Bout Money] which had been in a long running feud with rival gang 031 Bloods. In another unconnected incident a 23-year-old student was shot dead in Salford near Manchester. A man has been arrested, police have said [BBC].